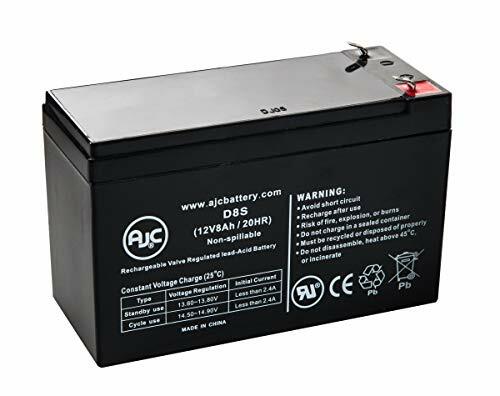 APC Back-UPS ES 550 8 Outlet 550VA, BE550R 12V 8Ah UPS Battery - This is an AJC Brand Replacement by AJC at Andy Pemberton. MPN: Back-UPS ES 550 8 Outlet 550VA. Hurry! Limited time offer. Offer valid only while supplies last. Battery is compatible with these Brands: APC. IMPORTANT: You MUST RE-USE: your existing cabling and hardware. These are replacement batteries only. Battery is compatible with these Brands: APC. IMPORTANT: You MUST RE-USE: your existing cabling and hardware. These are replacement batteries only. NOTE: It is your responsibility to verify the batteries being ordered match the batteries in your unit prior to placing your order. We are not responsible for incorrect orders. Chemistry: Sealed Lead Acid (AGM). Warranty: 1 Year. DISCLAIMER: Our products are not affiliated with or authorized by APC. If you have any questions about this product by AJC, contact us by completing and submitting the form below. If you are looking for a specif part number, please include it with your message.